Products from Today's Kitchen &, Bath, INC., a Cabinetry Company in Ellenboro, North Carolina. 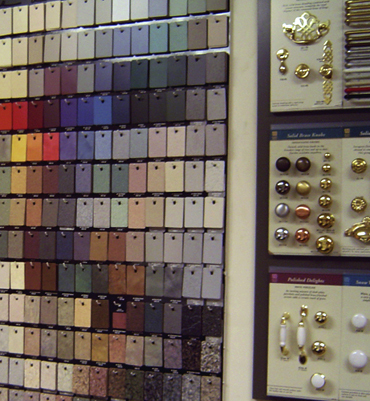 We offer a full line of knobs, Marble, Laminated and solid surfacing. Hardware- We have a diverse collection of cabinet knobs, & cabinet pulls to choose from. We have pulls and knobs finishes from polished brass, antique brass, polished chrome, and many more. Laminate- is durable, easy to maintain and can be used in many settings - kitchens, baths, kid's rooms and laundry rooms. We have many colors to choose from. Solid Surfacing- Imagine a surface that's as durable as it is beautiful. A surface that allows you to create the look and design you've always wanted. A surface that's easy to maintain, easy to repair and easy to love. Cultured MarbleIt is versatile enough for use throughout the house, but marble shines best in the bath. You can use it on almost every surface, including vanities, shower walls, and tub decks. Come by to visit our showroom or contact us. You won't believe the choices we have in hardware, solid surfacing, laminate counter tops and marble to help make your kitchen or bath complete.